When someone you love dies, it is a sad and trying time. When someone you love dies because of another person’s negligence or carelessness, it can be even more difficult. In addition to handling the grief and devastation of the death, there are often other concerns to consider. You may be worried about finances moving forward without that person or want to pursue justice for your loved one. In many of these instances, family members can file a wrongful death lawsuit against those responsible. Wrongful death cases can result in compensation to a victim’s family to cover funeral expenses, lost wages, lost benefits, mental anguish and more. Often, this compensation is incredibly important to families, both for closure and for financial security. Many cases are lost, however, due to avoidable mistakes. Simple errors can mean big trouble in a wrongful death claim. 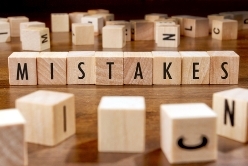 Avoid these three common errors to help ensure a strong case. Waiting too long to pursue the case. Though it can be difficult to think about a legal case after the death of a loved one, it is important to take prompt action. In Delaware, surviving family members have two years from the date of the death to file a claim. After two years, the courts will refuse to hear the case. It takes some time to gather the necessary information and file the proper paperwork. This is why getting started right away can help save a case. Communicating with an insurance company or representative of the responsible party. Insurance companies and those representing the person or people responsible for the death of your loved one are out to protect their own interests. While they may seem helpful, they will use any information gathered from you to leverage their own interests. Additionally, they may offer you a settlement that is unfair, and they will push you to sign paperwork to settle quickly. Not hiring a skilled wrongful death attorney. It can be overwhelming to find the right attorney to help with a wrongful death case, or even to know if you have a case worth pursuing at all. However, a skilled wrongful death attorney will have a thorough understanding of victims’ rights in Delaware and will push only for their clients’ best interests. They can help families gather evidence, file appropriate paperwork and fight the case in court if necessary. If someone you love has died as a result of another person’s carelessness, you may be entitled to compensation. The experienced legal team at Morris James Personal Injury Group can help protect the rights of your family and fight for the justice you deserve. Contact our team today for a free, no-obligation consultation to learn more about wrongful death in Delaware.